Criminal proceedings and immigration detention reviews both implicate an individual’s right to liberty. In both, standards of procedural fairness are meant to protect that right, to the extent required by the Canadian Constitution. In the former, robust procedural fairness safeguards are set out to ensure that a judge is impartial and independent, a defendant knows the case he has to meet, and the Crown and defendant are able to hear, present and respond to evidence. Ultimately, the standards are set out to ensure that an individual is imprisoned only when they are guilty of a crime beyond a reasonable doubt. The immigration detention regime involves less robust safeguards. In contrast to the criminal justice system, adjudicators in the tribunals overseeing detention review hearings are not bound by technical rules of evidence. Instead, adjudicators may consider evidence that is “credible and trustworthy in the circumstances.” Even this less exigent standard applies only in theory. For several years, the Canadian immigration detention system has been the target of harsh criticism from advocates, including from the International Human Rights Program (IHRP) at the University of Toronto, Faculty of Law. In 2015, the IHRP published “We Have No Rights”, which examined the arbitrary imprisonment and cruel treatment of migrants with mental health issues. In 2016, the IHRP published No Life for a Child, which assessed at the legal underpinnings and practical implications of immigration detention for children. In 2017, the IHRP published Invisible Children, which reviewed at the impact of the immigration detention system on Canadian children. Finally, in 2018, the IHRP, with other organizations, made a submission to the United Nations regarding immigration detention for Canada’s third Universal Periodic Review. Still, the government has made little progress in introducing meaningful and comprehensive legal protections in the immigration detention system. In July 2018, an external audit, commissioned by the Immigration and Refugee Board, reiterated many of the concerns that advocates have been pointing to for years. The external audit reviewed procedural fairness in detention review hearings. Through the examination of a random sample of cases in which detention lasted over 100 days, the audit found a range of issues relating to testing of evidence, adjudicators’ neutrality and independence, and barriers to release. The findings are troubling. In 2017, over 3,500 individuals were held in detention, and over 11,000 review hearings were held. Detention was ordered in 60% of hearings. The findings of the report beg the question: how many of the detention orders were justified? Just as a lack of impartiality obscures an evaluation of guilt in a criminal proceeding, the finding of partiality in a detention review hearing obscures an evaluation of the detention’s justifiability. 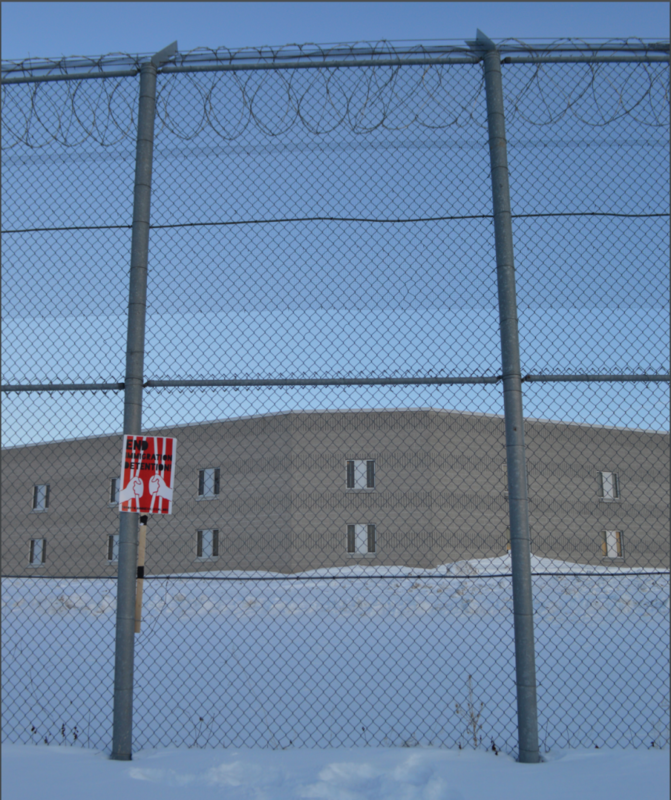 Outside Central East Correctional Centre, Lindsey, Ontario, in February 2015. Credit: End Immigration Detention Network. At a detention review hearing, an Immigration Detention (ID) Member determines whether continued detention is justified on the grounds of flight risk, danger to the public, or unclear identity. The ID Member is to act as a neutral arbiter, hearing and evaluating evidence from both the detainee and the CBSA, which represents the Minister of Public Safety and Emergency Preparedness. The first detention review hearing takes place 48 hours after CBSA makes the arrest, and if the ID Member finds that continued detention is required, another review hearing takes place 7 days later. If after 7 days, the ID Members again finds that continued detention is required, another review hearing takes place 30 days later. The exercise repeats itself until the detainee is released or deported. The audit found several profound gaps in the detention review system. First, ID Members often fail to adequately test evidence, and may rely on inaccurate and inconsistent facts. For instance, ID Members fail to call relevant witnesses, such as Enforcement Officers, to present sworn or affirmed evidence as to whether a detainee is a danger to the public or a flight risk. ID Members also fail to allow detainees to test evidence presented against them. In fact, ID Members discourage detainees from presenting evidence and testifying. As a result, ID Members conduct hearings without fully appreciating the circumstances of the cases before them. The issue surrounding evidence is all the more troubling given the finding that ID Members often rely too heavily on previous decisions. As noted in the audit, “negative assumptions, not rigorously supported by the evidence, would sometimes gradually become part of the accepted history for the detained person.” As inaccurate facts become part of the detainee’s narrative, release becomes increasingly unlikely. It is easy to imagine how, in the context of a criminal trial, this could lead to the imprisonment of innocent individuals. A second overarching issue identified in the audit relates to the neutrality and independence of ID Members. Most significantly, ID Members were found to often rely uncritically on statements made by CBSA Hearing Officers. The audit cites examples of ID Members appearing intimidated by the CBSA Hearing Officer, or exhibiting “over-familiarity with CBSA Hearings Officers.” Again, in the context of a criminal proceeding, it would be difficult to trust or accept a conviction if the Crown had intimidated or exhibited over-familiarity with the judge. Finally, the audit identifies several additional barriers to release. Lack of representation is a significant issue. In one region, the audit found that only 38% of hearings were conducted with counsel for detainees. The audit also found that many ID Members take a formulaic approach in their assessments of the need for continued detention. That is, in some cases, ID Members used decades-old criminal convictions or asylum claims to justify continued detention, instead of considering more relevant contextual evidence. Finally, the audit found that many ID Members fail to clearly express what is necessary or sufficient for a release. If detainees do not know what it is they need to evince in order to be released, such as a rehabilitation program, their detention is likely to be prolonged. Given the rights at stake, it is difficult to understand why the standards of procedural fairness have been so neglected in detention review hearings. There is an obvious need for reform in the ID and its detention review hearings. The audit makes numerous recommendations to improve procedural fairness, including increasing oversight of cases and developing tools to support more robust reviews. If implemented, these are likely to lead to some improvements. However, the bar needs to be set higher – at present, even simply providing access to decisions and transcripts in advance of a hearing would, in and of itself, be an important improvement. There is therefore a need to continue to engage on the topic of immigration detention reviews, until we can be assured that individuals’ liberty is not unnecessarily infringed. We must continue to ask why, in our society, in 2018, non-citizens are deprived of their liberty without the safeguards we expect for accused criminals. We must continue to question how we can justify the detention of non-citizens in the same jails as convicted criminals, with no release date in sight.